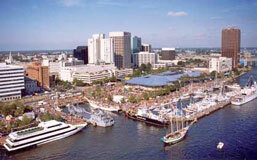 The Sheraton Virginia Beach is located on the boardwalk. Their famous Sweet Sleeper beds and the sounds of the ocean waves will lull you to sleep every night. Be sure to request an ocean view room with balcony. The Sheraton's amenities include an outdoor pool, heated indoor pool, hot tub, and fitness room. There are two restaurants on-site. 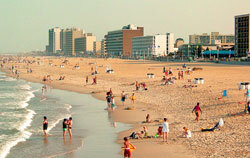 The hotel is located at 3501 Atlantic Avenue in Virginia Beach, Virginia on the oceanfront. Map. It's at the northern end of the beach, which is quieter than further south.